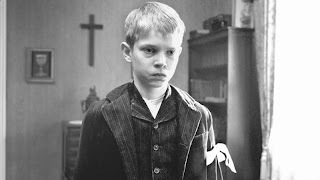 Directors before Michael Haneke have asked the same fundamental question that permeates his elegiac, trenchant study of darkness and light, Das weiße Band (2009) –namely, with specific reference to Germany, from whence did the affiliation with fascism rise, and how did a people turn a blind eye to the atrocities in their midst during the 20th century? Haneke (who also wrote this Cannes-lauded tale) has already proved himself a director more than adept at dealing with darkness – both his Funny Games (1997 and 2007) and his end-of-the-world-as-banality Le temps du loup (The Time of the Wolf) (2003) show an artist unafraid to take viewers into landscapes, both literal and interior, that are far removed from safe ‘normality’. And so it is with his latest – set on the eve of World War I, a series of strange, disturbing and seemingly inexplicable events begin to afflict a small village, Eichwald, in northern Germany, in which half the population works for the Baron (Ulrich Tukur) and are strongly influenced by the strict Protestant pastor (Burghart Klaussner). As the occurrences unfold, beginning with the local doctor (Rainer Block) being seriously injured when his horse stumbles over what is subsequently discovered to be a deliberately set trip wire between two trees, village teacher Lehrer (Christian Friedel, whose welcoming older voice, as portrayed by Ernst Jacobi, recounts the tale) becomes increasingly determined to find a solution to the mystery. However, it is a quest, much as was the case in Haneke’s earlier work Caché (2005), that is doomed to failure. Haneke paints a meticulous portrait of a still largely 19th-century agricultural community that is far removed from the mechanization and mass-murder of the 20th century that is set to engulf them but which, despite the severe moral strictures under which all still live, is nevertheless a village in which almost no family is a stranger to the evils of maliciousness, child abuse, adultery and premature death. The exception to the rule appears to be the childless Lehrer himself – the absence of children from his own life, save those under his guard at school, is shown to be the reason for his greater clarity of perception, but this does him nor anyone else little good in the end. Christian Berger’s immaculate monochrome cinematography helps the film’s near-perfect depiction of a time and place enormously, and the acting across the board is much as you would expect of a recipient of Cannes’ highest honour. And does it deserve it? Well, the same question is asked every year, so this reviewer will politely refrain from opining on that point, save to say that Das weiße Band is clearly one of the year’s best, offering insights into the worst of humanity that will long remain with the viewer. Of course, alongside the film’s general analysis of humanity there are implicit suggestions of tendencies in the German character and culture that point towards reasons for the developments in the country’s subsequent three decades, which may court some controversy for its director, but that the film is set in Germany is in fact neither here nor there – this could be anywhere, anytime. We have seen the monster, and it is us. 144 mins. Black and white. In German and Italian.